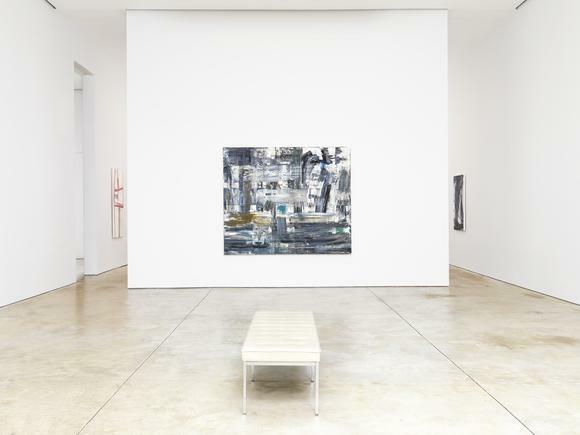 Cheim & Read is pleased to announce an exhibition of new paintings by Louise Fishman. The work will be accompanied by a catalogue with an essay by Alex Greenberger. Her last show with the gallery was in 2012. Born in 1939 in Philadelphia, Fishman grew up during the height of Abstract Expressionism and its male-dominated hierarchies. Both her mother and aunt were artists, and her childhood was steeped in art history and artistic discourse. She attended Tyler School of Art and was an active participant in the feminist movement of the 1960s and 70s. After explorations with other materials and methodologies, Fishman embraced painting at a moment when many claimed it was ‘dead.’ Her decisive re-appropriation of gestural abstraction was an affront not only to Ab-Ex’s patriarchal lineage, but to postmodernism’s didactic conceptualism. It also consciously rebelled against the trend of incorporating craft-based “women’s work” or techniques. Her 1973 “Angry Women” series was seminal not only for the merging of text and abstraction, but for its pure emotional expression, as told from a woman’s point of view. Her newest work has not lost this edge, nor its fragile balance of opposing forces. In the paintings shown here, all made in 2013-2015, the formalism of the grid and its geometry strain against the organic and calligraphic marks which fight it, resulting in compositions of complex spatial interplay. In works like Nama-Rupa, 2014, and These Lines, These Colors, This Silence, 2014, the grid structure is visible but distorted by swaths and scrapes of saturated color. In As Near as Memory, 2014, and Rookery, 2014, the grid itself seems torqued and unhinged. Others, like Arcanum, 2015, and Bel Canto, 2014, are stabilized by strong, vertical stripes of paint. Color—mostly blues and reds, with some yellow and green—is many-hued, and has its own particular meanings and associations for Fishman, originating from influences as varied as Titian to the color of her partner’s eyes. Image and Witness, 2015, with its windowpane of gray and black, speaks to the core of Fishman’s practice: as the title states, it is at once image and witness, providing testimony, however elusive, to her experiences. However, the viewer, too, is witness. Standing before it, peering into its striations of color and light, one is reminded of the force of our own emotional lives, and the collective energy we share. Fishman lives and works in New York City. Widely shown, her work is represented in many important museum collections, including: the Metropolitan Museum of Art, New York; the Whitney Museum of American Art, New York; the National Museum of Women in the Arts, Washington, D.C.; and the Jewish Museum, New York, among others. She has received many awards, including a Guggenheim Fellowship, and has participated in several artists’ residencies, most recently at the Emily Harvey Foundation in Venice, Italy. Fishman has a major retrospective, curated by Helaine Posner, opening on April 3 at the Neuberger Museum of Art. In addition, an exhibition of her small-scale work, curated by Ingrid Schaffner, will open at the Institute of Contemporary Art, Philadelphia on May 4. A major monograph, published by DelMonico Books/Prestel, will accompany the exhibitions. She has been represented by Cheim & Read since 1998.